Get essential support for your head and your heart when you try Now's Ultra Omega 3. Omega 3 fatty acids have long been considered excellent nutrients for cardiovascular and cognitive health. Derived from fish oil concentrate, these important ingredients are well known for their ability to help prevent cardiovascular disease and decrease memory loss. 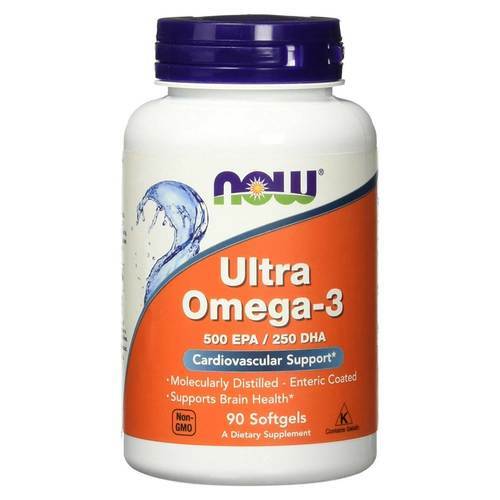 Now's Ultra Omega 3 contains extra strength doses of EPA and DHA, two essential fatty acids that help improve brain function and development and increase circulation and blood viscocity. Ultra Omega 3 is a molecularly distilled, enteric coated and odor controlled supplement is formulated to help reduce the occurrence of nausea and reflux that sometimes accompanies ingestion of fish oil supplements. Order yours today at eVitamins. 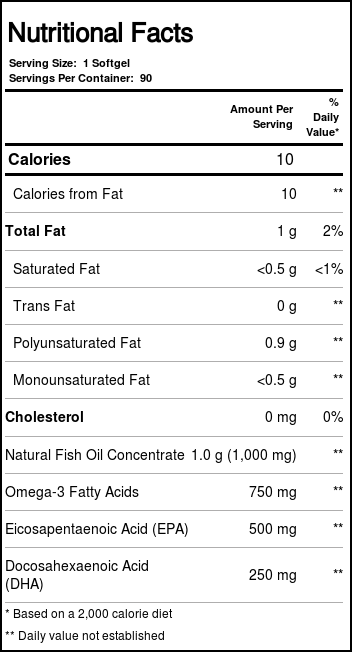 Notes: Fish oil is product of Peru. The customer reviews posted below are based on individual consumer experiences and may NOT necessarily represent what expected results will be from using or taking Now Foods Ultra Omega 3 - 750 mg - 90 Softgels. These results may not be typical and you should not necessarily expect to receive the same results. Actual results may vary. Omega top of the market. ultra omega 3 now, now is the best functional supplement company in the world, super fan and this omega 3 has one of the highest concentrations of EPA and DHA (which is really important in the product) 500mg EPA and 250mg DHA in 1000mg of the capsules. Compared to \xf4megas 3 Brazilians who have a maximum of 550mg in the total capsule, making them well below this. Compared to other products I have used in the same segment, it has a higher concentration of EPA and DHA, making cost-effectiveness much better. I recommend and soon I will be requesting more units not only for me, but also for my family. I have tried them all..the most expensive, the ones that are highly recommended but without a doubt the e vitamins, Ultra Omega 3 750 mg - 90 Softgels are the most effective and the best value by far, try them, you won't be disappointed. My family and friends are now buying them too.